Resources > Articles	> Think a Loyalty Program Won’t Help with the Back-to-school Crowd? Think a Loyalty Program Won’t Help with the Back-to-school Crowd? The back-to-school retail season is descending upon us. And that’s a pretty big deal, because this is the second largest spending “holiday” in retail. And back to school and back to college aren’t just important for the brick and mortar stores. According to Field Agent’s 2016 Back to School Report, 64% of families will purchase at least some of the school supplies they need online! So what can ecommerce retailers do? Well, the easy answer is promote well and encourage customer retention. 1. The spending surge may be quick, but this is no temporary opportunity! Isn’t BTS and BTC shopping just a temporary thing? Well, yes. Kids and college students do go back to school just once a year. But instead of just letting customers flow in with empty hands and out with books, rulers and laptops, retailers should focus on getting a bit more information from customers wherever they can. When it comes to ecommerce, engaging customers and getting them to join your loyalty program with a specific offer that applies on purchases in the back-to-school time frame is how you can engage customers now. Not only that, it also gives you new ways keep in touch with them later in the year, once they’ve settled into their new routine. Consider offering points to members who fill out forms about their personal details and interests. That extra info makes it really easy to present relevant offers later on! One other great thing about back-to-school is that we already have so much information about the student demographic. Trends and experience point to what students (or parents) might need (or want) a bit later in the year. Does your dorm room wall need a new poster? Is your child or teacher in need of some more printer paper? Your marketing team can plan now for sales on updates, refills, or other needs. Be the first to reach out proactively, and be the first to fulfill those needs. 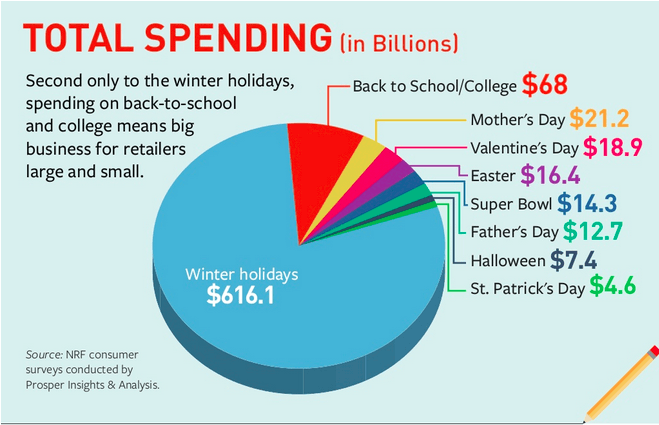 National Retail Federation stats on the retail spending seasons, via Digiday. Another thing she said is that “retailers need to let go of the idea that they can create demand for products.” And that’s a really good point. I personally think retailers who will succeed the most in creating buzz this year already know that students need the stuff, not the shops. Retailers should focus on creative promotions, showing off sweet deals that make customers choose THEM, as well as working on cross- and up-sells. And, the big takeaway? Retailers need to offer a great user experience on mobile. So make product search easy and make sure your loyalty program and its associated rewards and offers are available on a range of devices. Oh! And don’t forget to introduce a couple of temporary school-supply or school-fashion related offers between now and September, featured front-and-center on mobile devices. Did you know Facebook Messenger and Spring can be used to sell products on mobile? It’s kind of like a personal shopper! It’s actually a bot that helps customers choose the right products and place their orders directly from the popular app, bridging the gap between mobile search and mobile purchase. Students are always interested in what their peers are doing. Parents too, for that matter. So make this a season of referrals! 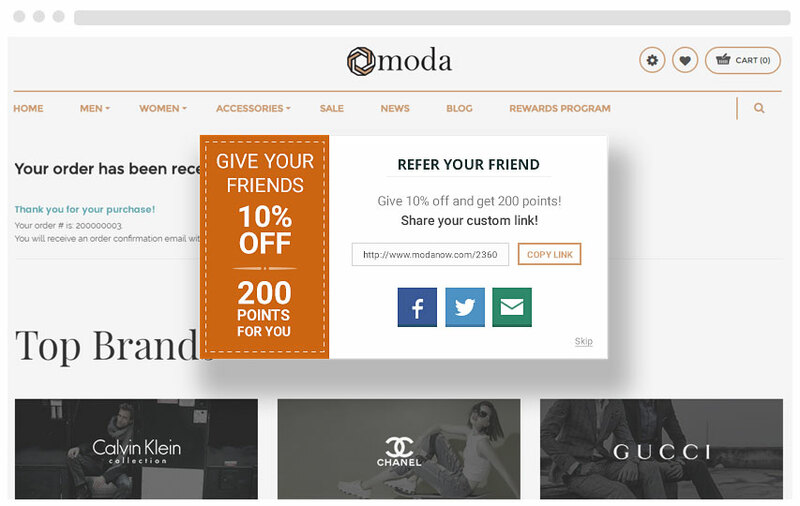 A loyalty program that encourages and rewards referrals is a great way to draw attention to your products. Think of it as the digital version of word-of-mouth. It’s all about increasing trust and visibility. And it’s easy. When customers make a purchase, they share it on social media. Then friends who click through are presented with a coupon. That’s great incentive to look around for their back to school needs in your store, and can be a great way for you to add yet another loyal customer to your rewards program. Moreover, referrals can generate more than twice the sales that paid advertising can. Why? Because your current customers are the ones who can bring in the best potential prospects: their peers. Are you making it easy for customers to spread the word (and incentives) about your products? A loyalty program is a great way to do so, rewarding both current customers who share and their friends that start shopping at your store. How are other major retailers preparing for the 2016 BTS season? Office Depot, a school-and-office supply leader, is using this rush to promote its buy-online, pickup-in-store service. That’s a nice omnichannel combo. According to Internet Retailer, they’re also hiring 8,000 summer workers for the back-to-school rush. Interestingly enough, JCPenney is similarly promoting their buy online, pick-up in store same-day service. The great benefit of this type of program is not having to search around crowded stores for the items students need. AdAge wrote that the retailer is also showing off their charitable side, donating $1 to YMCA for each pair of Arizona jeans sold – a great way for customers to identify with the brand and see their philanthropic side. 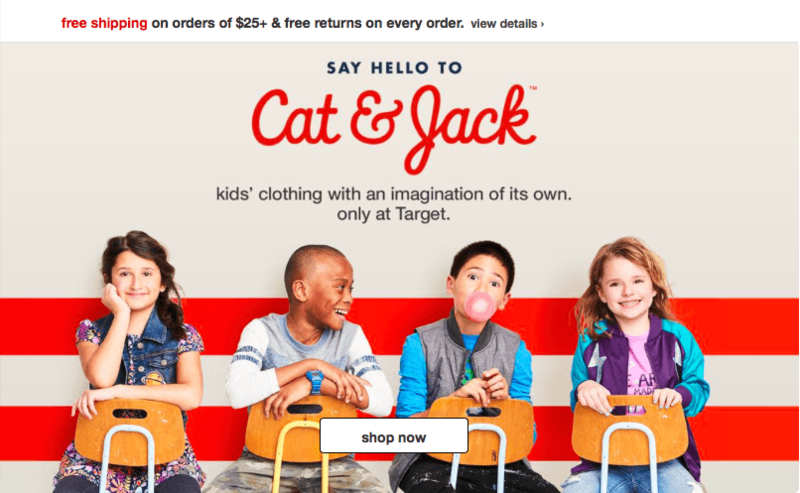 Target took a creative approach to advertising their products directly to the demographic they seek – Drug Store News reports that Target actually involved schoolchildren in a lot of their preparations, from product development to marketing. To see the kid-created videos, check out Fast Co-Create’s article. Next stop? The Container Store. Without this place, I wouldn’t have survived freshman year. The organizational retailer has partnered up with UNICEF for the summer season to encourage donations. EPR Retail News reports that they’re encouraging donations in-store and online, with a goal of reaching $250,000 for UNICEF’s effort to help every child get the education they need. This partnership is a no-brainer for the back-to-school season! Get ready for the rush – and make sure your customer retention tools are in place! Our team wishes you a fantastic back-to-school and back-to-college season this year! If you’d like to add a loyalty program to your e-commerce store, a ready-to-integrate solution like Antavo is the way to get up and running just in time! Sign up for a free VIP demo to learn more. Did you learn from this article? To get more great posts about e-commerce marketing and customer loyalty delivered straight to your inbox twice a week, sign up for our newsletter. Let’s keep in touch! Jessica is an expert on all topics related to customer loyalty, helping fashion and retail companies to learn more about their possibilities in CRM and customer retention, so they can launch successful loyalty programs. Fun fact: in her free time, she loves to dance, paint teddy bears, and learn Russian.